Siddharth Khullar and his teammates won $7,500 in the MIT IDEAS Global Challenge for their retinal imaging device. Siddharth Khullar is on a roll. 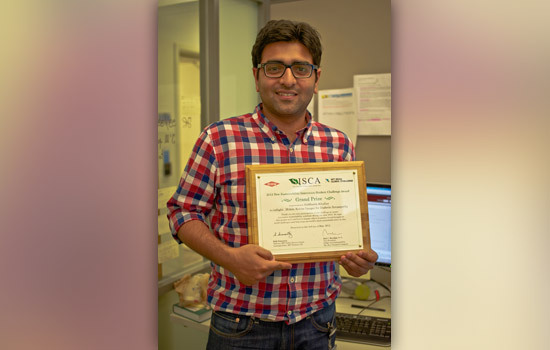 The Rochester Institute of Technology doctoral student, originally from New Delhi, India, has won two national competitions this year for a retinal imaging device he helped develop at Massachusetts Institute of Technology’s Media Lab. Khullar and his team at the Media Lab won first place and $150,000 on July 19 in the Prize for Primary Healthcare, sponsored by Massachusetts General Hospital and the Center for Integration of Medicine and Innovative Technology, a consortium of Boston’s teaching hospitals and universities. The competition encourages engineering students to apply their skills to health-care solutions. In May, the team’s medical device won a “Judges’ Choice” award and $7,500 in the MIT IDEAS Global Challenge, an annual competition for socially driven start-up companies. Khullar, Everett Lawson, Jason Boggess and Di Wu won both prizes for their “Fast Retinal Imaging for Diverse Screening via Binocular Coupling.” The portable instrument images the human retina and screens for diabetic retinopathy, HIV/AIDS-related retinitis and age-related macular degeneration—conditions that can lead to blindness without early diagnosis and treatment. It can rapidly image a patient’s retina without dilating eye drops and does not require technical skill to operate. The simplified technology would enable low-cost screening during routine primary care visits and could have a significant impact in developing countries. Second place in the Prize for Primary Healthcare went to a team that developed a home-monitoring approach for patients with chronic congestive heart failure. Two teams tied for third place with their noninvasive approach to glucose monitoring for diabetics and rapid identification of pathogens in small blood samples. The finalists competed against 10 teams picked from 75 preliminary entries in February. The semifinalist teams were awarded $10,000 to fund their full entry due this past June. Khullar’s collaboration on the retinal imaging device arose from a year spent as a visiting student with the Camera Culture Group at the MIT Media Lab. He is currently finishing a summer internship at Microsoft Research in Seattle and will return to RIT this fall to complete his doctoral degree. Khullar’s thesis research will improve analysis of functional MRI data for identifying brain diseases like schizophrenia and autism through computational imaging methods. He conducts most of his thesis research as a graduate research associate at the Medical Image Analysis Lab at the Mind Research Network for Neurodiagnostic Discovery and Mental Illness in Albuquerque, N.M.